XL coin capsules are ideal for storing particularly large coins of up to 76 mm in diameter  for example, 5 oz America the Beautiful silver coins. 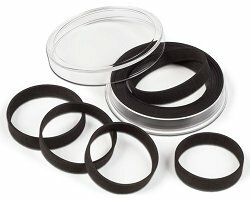 They contain 12 individually removable spacing rings made from black foam (free from acid and chemical softeners), also allowing smaller coins of up to 29 mm in diameter to fit perfectly in the capsule. The inside height of the capsule is 6.3 mm, while the exterior height is 12 mm. Exterior diameter: 82 mm. The coin capsules are made from high-quality, scratch-resistant plastic and are ideal as a replacement for scratched or defective original capsules for larger coins. They have a secure, yet easy-to-open lock. Pack of 2.